HOUSTON, Tex. 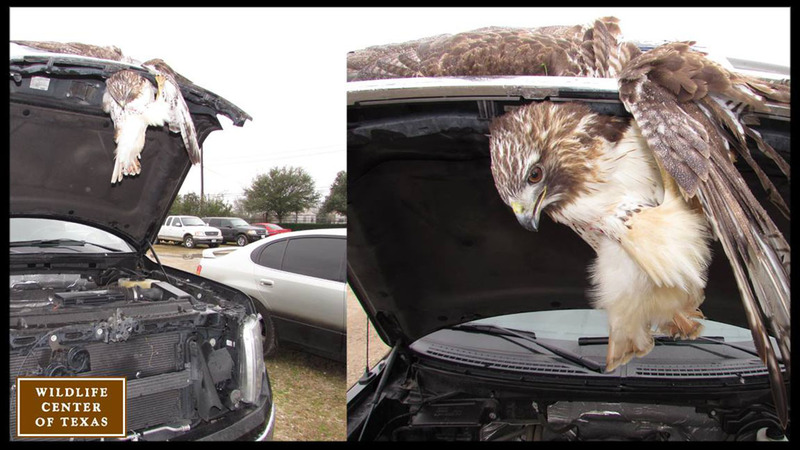 -- A hawk is making an amazing recovery after being hit by a truck, and getting caught in the grill. Andy Sommerville was driving back to Houston from College Station last Wednesday when he felt a bump. "I just thought maybe I'd hit a bird and it bounced off or whatever," Sommerville says. It was a bird, but it didn't bounce off. Sommerville tells us he didn't notice until he got to work the next day and saw feathers coming from the grill. "I was checking it out and I actually popped the hood from the inside and reached in to unlatch when he actually was still alive and latched onto my finger, bit my finger," he said. It turns out he'd hit a red-tailed hawk. He called animal rescue, and a team from the Houston SPCA and the Wildlife Center of Texas rushed to get the bird. "He's got a lot of soft tissue damage in this wing, and then see how it doesn't come out as far. Nothing broken though, on the X-rays," says Wildlife Center of Houston Executive Director Sharon Schmalz. "Then he's got a wound on this side where he was hanging." He's being nursed back to health at the Wildlife Center of Texas. Schmalz tells us the hawk is on antibiotics to keep his wounds from getting infected, anti-inflammatories and pain meds. But this little guy was lucky to escape his brush with death with such minor injuries. "He'll stay in here with us inside, and then eventually he'll go into a large flight cage where we can get him exercising and get all his muscle tone back and get him back into the wild." It'll probably take about six to eight weeks to get the hawk ready to be released.